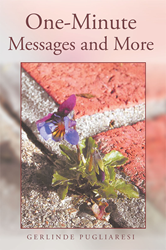 “One-Minute Messages and More” from Christian Faith Publishing author Gerlinde Pugliaresi was written in an uncompromising way for those who feel like they do not have the time to pause and listen to God. It is a document that enables people to discover what God is saying to them in the moment. “One-Minute Messages and More”: a testimony to the Father, Son, and Holy Spirit’s unending love from a devoted servant. “One-Minute Messages and More” is the creation of published author, Gerlinde Pugliaresi. Gerlinde was born in Pomerania in 1939, the year World War II began. Evacuated in 1945 into what later became East Germany, she grew up under communist rule. She and her mother fled at night in 1953 by crossing into West Berlin as refugees. They remained there for three month in a refugee camp before being flown into West Germany. There, they remained in refugee camps for two years before leaving to take jobs in Stuttgart. She married in 1960 and had a baby in 1964 before the family immigrated to the United States that year. Born again in 1974, Gerlinde married a second time in 1978 and remained in that marriage for thirty-one years, seven months, and nineteen days. Her beloved husband passed in 2009. In 2012, she moved to Texas with her daughter and son-in-law where they still live as a very close-knit family, serving God as He leads. Published by Christian Faith Publishing, Gerlinde Pugliaresi’s new book is a manuscript inspired by God’s instruction. Every week, author Gerlinde Pugliaresi’s pastor would post one-minute messages on the back of the church bulletin. She saved every single one of them. Along with the one-minute messages and the responses to them, Gerlinde began adding the Sunday school outlines to her collection of writings. In 2013, the Lord gave her instruction to add more of His teachings. She then arranged them into a manuscript. Since it was His work, Gerlinde only shared the manuscript with a few individuals, but she recently received instructions to publish the manuscript. She knows God will use it to His Glory in the way it was meant, revealing His heart to mankind. View a synopsis of “One-Minute Messages and More” on YouTube. Consumers can purchase “One-Minute Messages and More” at traditional brick & mortar bookstores, or online at Amazon.com, Apple iTunes store, or Barnes and Noble. For additional information or inquiries about “One-Minute Messages and More,” contact the Christian Faith Publishing media department at 866-554-0919.